From the first step you prepare your body for deep cleansing. Rid it of toxins and toxins. The occurrence of diseases is caused by toxins. Intoxication usually occurs without symptoms. The body removes toxins through the intestines and kidneys, but if these organs fail, then the skin and lungs are connected. Toxin (from Greek toxikos - poisonous) is a poison of biological origin. They are produced, for example, by tumor cells, infectious (from Lat. Inficio - saturate, infect) with agents - bacteria, viruses, fungi (mycotoxins), or parasites, in particular, helminths. Water-soluble, their most in the body - 80%. You can neutralize them using the product H-500. This is an antioxidant that removes toxins, drink 1 capsule 2 times a day 30 minutes before meals, dissolved in a glass of warm water and the product Coral-Mine. It is a water enrichment with natural minerals, it returns chemical and physical properties to water, it is necessary for effective removal of water-soluble toxins from the body. You can neutralize them using the product Assimilator. It helps the pancreas, breaks down food, reduces the formation of toxins, drink 1 capsule after each meal and the product Coral Lecithin. It protects the cell membranes from damage by toxins and removes from the body, drink 2 capsules 2 times a day after meals. 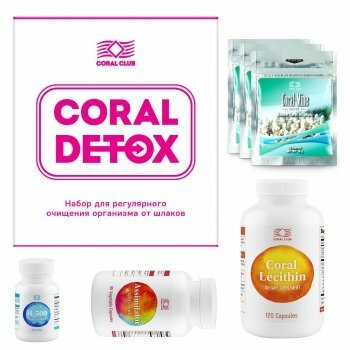 This set of products Assimilator, H-500, Coral Lecithin, Coral-Mine is called Coral Detox. Start this program to restore the internal environment and after 3 months the body will give you restored health! When taking Coral Detox, exclude sugar, except fruits and berries (limit grapes, pears, apples), yeast dough, fried, fatty, salty, sweet, preserved with vinegar, alcohol, beef and pork, sauces, ketchups, carbonated drinks, packaged juices. Milk only in tea and coffee. You can fermented milk products, cheeses, vegetable oil in salads or porridge, limit the butter. Put one packet of sachet from Coral-Mine without opening a bottle of non-carbonated water in 1.5-2 liters. Shake up. After 5-10 minutes you can drink. Take 30 minutes before meals and not earlier than 1-1.5 hours after meals. Trying to drink water during the day, after you drank, be sure to close the lid. H-500 dissolve 1 capsule in ⅓ cup of hot water 50-60 degrees. Stir with a plastic spoon. Wash it down with plain warm water. Take 2 times a day 30 minutes before meals, in the morning and before lunch. Assimilator drink 1 capsule 10 minutes before meals 3 times a day, washed down with a small amount of plain water. If you can not swallow the capsule, pour the contents of the capsule into a spoon and wash down with water. Coral Lecithin drink 1 capsule after or during meals 3 times a day. Capsule can chew if you can not swallow.